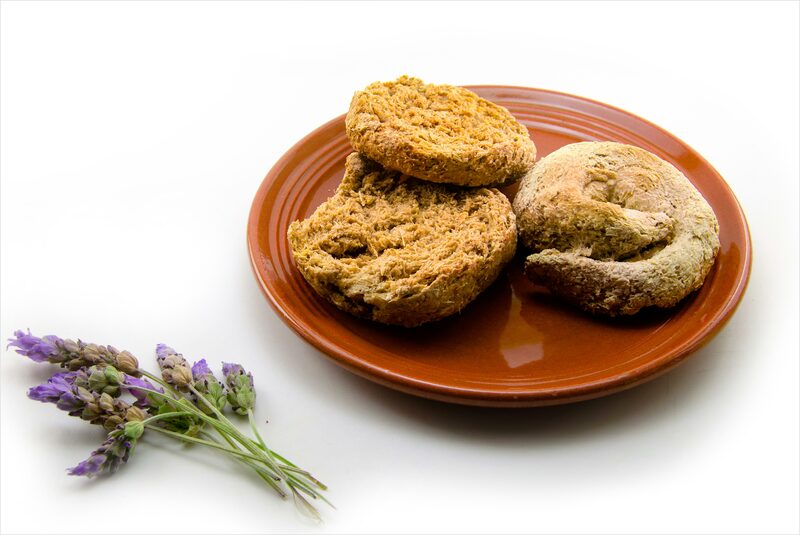 Cretan rusk (paximadi) is a characteristic Cretan product with a long history and tradition, closely connected to the nutritional habits of the island’s inhabitants. The quality, distinctive flavor and way of production of the Cretan rusk are the main characteristics where its classification as a product of Protected Geographical Indication (P.G.I.) was based. It is a round-shaped P.G.I. rusk made from barley flour, enriched with Cretan olive oil (P.D.O.) and often topped with fresh, trimmed tomato, aromatic Minoan herbs, and crumbled xinomizithra cheese (P.D.O.). There are many kinds of Cretan rusk. Even though their basic characteristics are the same, variations exist in the use of raw materials and the recipes used in different areas of production. The flour used is made of soft or hard wheat, barley and rye. Depending on their shape, ingredients and recipe, they are categorized as “choriatika” (rustic), barley rusks, wheat rusks, rye rusks and “eptazyma”. They have an irregular and rough texture, golden yellow to dark brown color, while their organoleptic characteristics are similar to those of bread made from the same raw materials. The history of rusk goes back for centuries and the basic need that led to its creation and establishment in the Cretan diet, was maintaining the bread for a long time; especially for those that had to work away from home. The dough is made and kneaded in the same way as bread, with a mixture of flour and water. When the dough rises, it is baked for the first time. Then, it is cut into slices straight from the oven, and baked again at a lower temperature until crispy and dry. When the rusks cool to room temperature, they are packaged and stored. Cretan rusks are produced with no preservatives and thus constitute a very healthy product with significant nutritional value as they contain fiber, vitamins etc. They are also among the most famous local products, found on every Cretan table and event. They are often consumed instead of bread or used as a basis for delicious recipes.